Some years after my Degree in Architecture, I joined the Master’s course ID&A 2011: Industrial Design & furniture designat Superior School of Industrial Technologies in Florence, and this introduced me actively to the Design world. After that, I started to design “objects” aside from working in architecture. Design competitions were my motivation, and one of my first projects, called “El me cagneto” (a dog house for interiors), was noticed by Din Design, a collective organization at Fuorisalone of Milanin 2015 and invited me to exhibit it with them, where they had a specific section dedicated to Pet Design. That was a new world for me, and after that my project got published in many design reviews, web sites, books, and this gave me the strength to continue in this field. 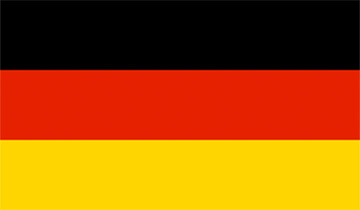 After that experience I was more and more active in product and furniture design fields. Competitions are always a good inspiration and a starting point for me, I like the challenge of “inventing” something new and the idea of creating a piece of design that can have a utility and a strong concept, where game, irony and modularity are always key ingredients. 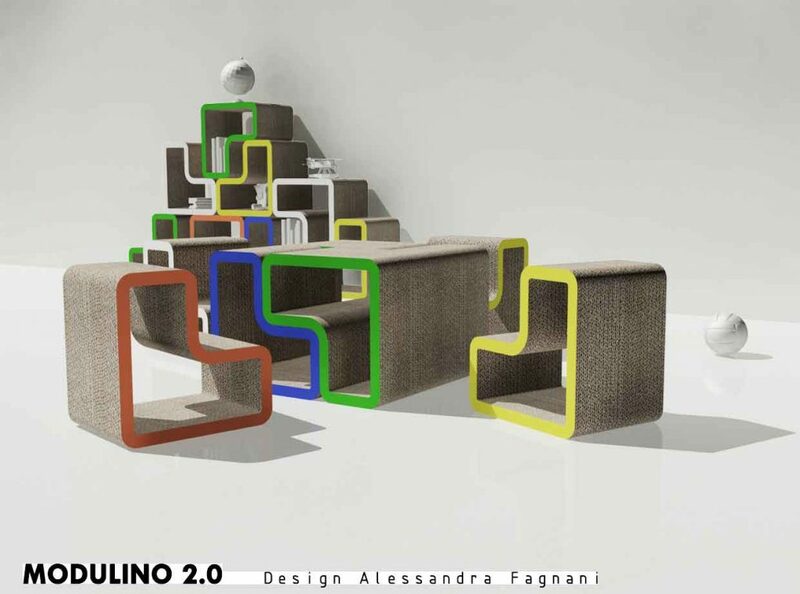 What was your inspiration for your play furniture & chair for children Modulino 2.0? 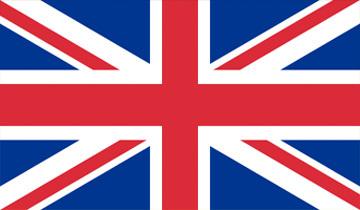 Modularity and simplicity are always strong concepts that I want to use in my projects. 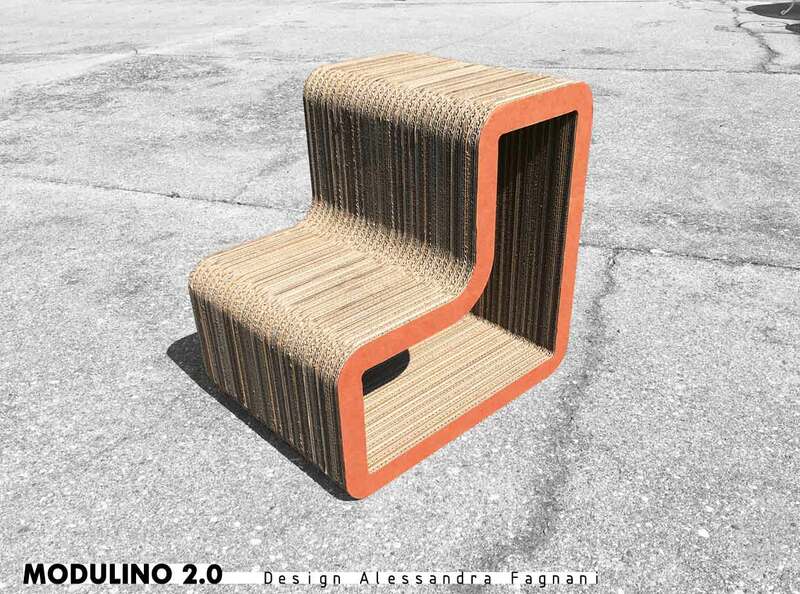 Modulino 2.0was created again for a competition made by a company that produces plastic design products. I created something for kids because design is usually oriented towards adults. 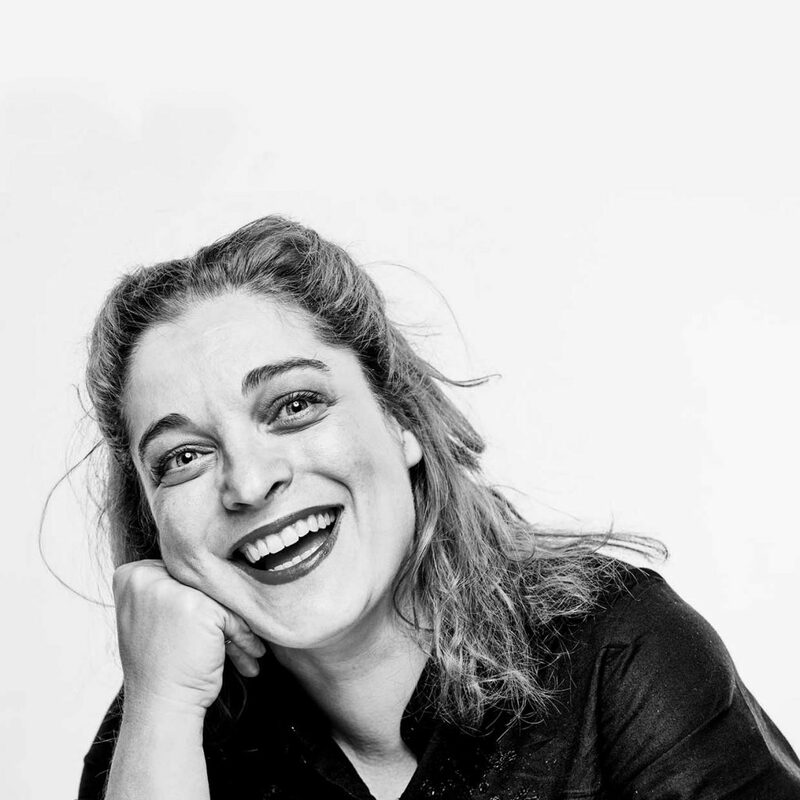 I always strive to do something different, and the world of children and animals I feel is still a part of our design field which has a lot of room for development, as it is not always considered to be economically viable. I converted the “plastic” modulino (created for the competition) into Modulino 2.0 because plastic is not a sustainable material. I was looking into a sustainable solution with lower waste. As cardboard is a sustainable, recyclable and a natural material with a low impact on the environment, to me this was the most suitable material for use in our current time and design climate. I enjoyed the challenge of its structural characteristics and durability when worked in a certain way. 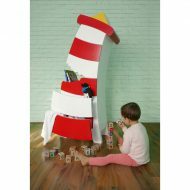 Why is your chair especially suited for children as a play furniture ? 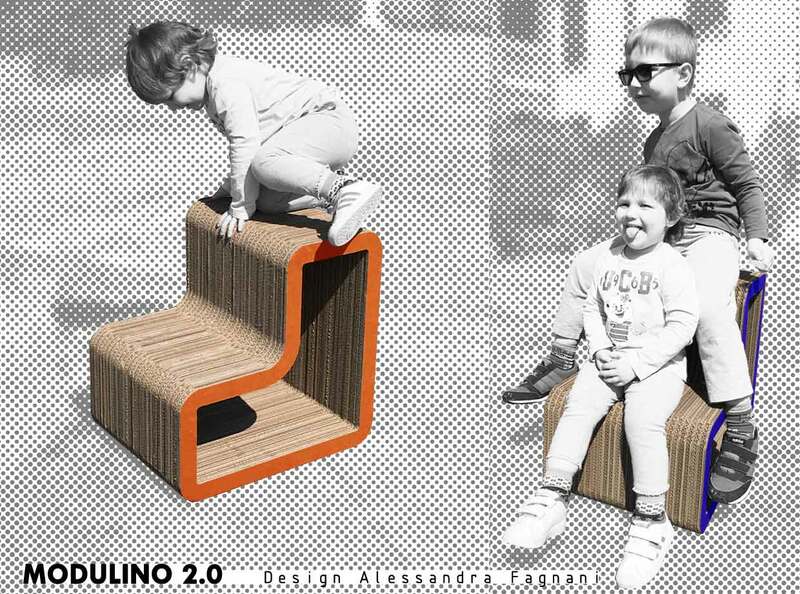 Modulino 2.0 is a kind of toy itself, not only a chair. It is light, natural, simple, durable and fun. The height of the seat, and the height of the table created through its combination are ergonomically intended for kids between 3 and 6 years old. 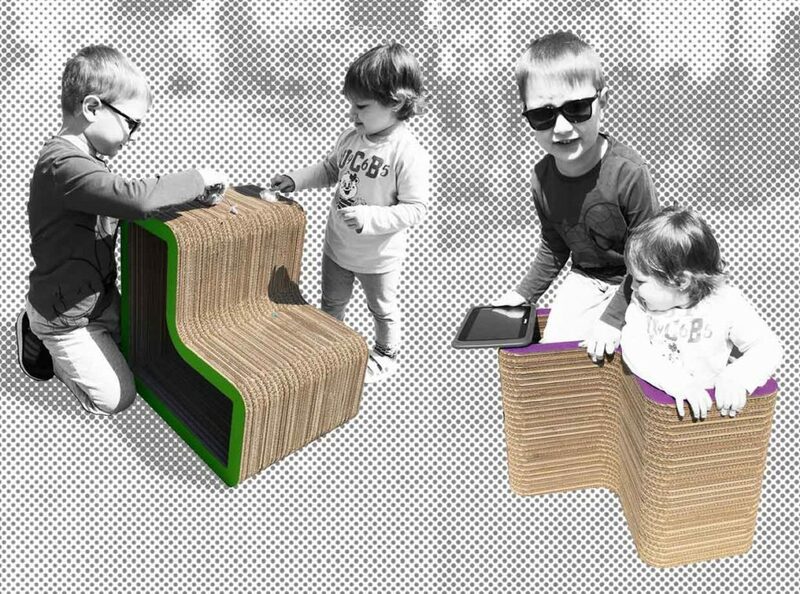 Childrens can use it to play, to move, to pass through and to create and compose other types of furniture and playful configurations – like tables, book shelves, benches, seating etc. I like the challenge of designing forms and constructions that are simple to produce and can have many possibilities through their use. For example, if you use compose Modolino 2.0 in a certain way you can change the arrangement of a room, or the use of a space. Are there other products that you produce specifically for children? Unlikely I don’t have other products produced for children, but many ideas that I am keen to develop. I have a lot of fond memories from summers playing in a blow-up swimming pool given to us by my Grandfather, who was a very special and unconventional person. My cousins and I spent all afternoons enjoying playing in the water.We also had manyanimalsat home, which were a constant source of fun for us, and we played in the countryside on the farm where I grew up. I drew a lot, reproducing all my cartoon heroes. I was always playing with my older cousin and my preferred toys were typically “boy’s toys”, like cars, robots and transformers. My favourite toy was a bigGoldrake- the famous “Super Robot” – an icon of Japanese cartoons and based on the manga of Go Nagai. It was bigger than me at the time and I loved it! It was made of a Robot-like, shiny fabric outside and polystyrene inside. as I was playing with it so much, the robot became a little dirty and very “vintage” quickly, so my mother decided it was not hygienic anymore (that was the formal excuse) and gave it away to the local kindergarten. I remember crying like crazy because of this loss and never forgave my mother for giving my Goldrake away! I cannot think of a completely superfluous toy specifically, but I would definitely eliminate all the “toys” that do not develop the imagination. I think toys that have the purpose to “construct” something are the best. Kids need to develop their personal imagination and capability to create something,in order to be able to build with their hands and to see the result of their “work”. I think that this is very important for development and teaches you to deal with future life. Superfluous until a certain age are definitely video games,and generally games that require you to sit. Kids need to move, to experiment, to go out and to interact with animals. 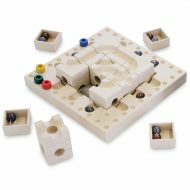 I don’t have a specific project in mind, but for sure something instructional that can help children develop their creativity and their capability to build something with their hands, or that they can easily transform in something else.